Last week in response to certain pressures on the farm we implemented some new strategies and this week we enjoyed witnessing some results. 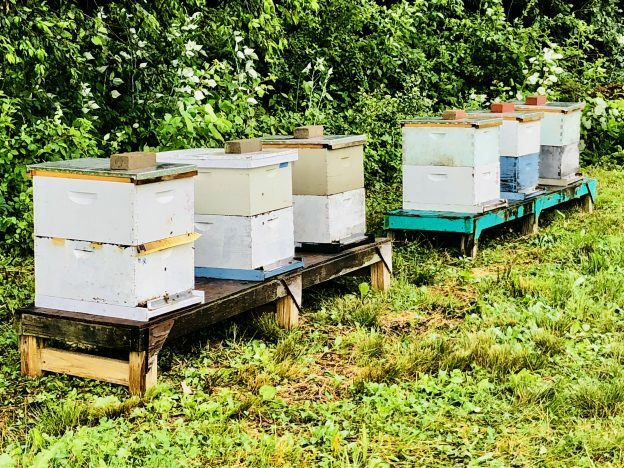 Our setup of six hives of honey bees made of white and sky blue painted rustic wood reminds me of a shanty town in the Caribbean. Those bees are buzzing and hard at work pollinating our tomatoes, squash, and cucumber plants. The change was instantaneous and noticeable in stark contrast to the lack of pollination going on a couple weeks ago. Our biggest pressure this season aside from all the rain and flooding in May and early June have been an inundation of deer. There is a herd of about 40 of them and our farm has become their favorite restaurant. Temporary fences, nets, and row covers have not been effective and it is frustrating to plant a fresh bed of lettuce to arrive the next morning only to find it almost completely decimated overnight. We have recently acquired special off season hunting permits from Maryland’s Department of Natural Resources and have enlisted the assistance of a couple of hunter’s that happen to also be CSA Members. This week they are getting the lay of the land and observing the flow patterns and habits of the deer, next week I am hopeful to start seeing some results. I am hoping to provide meat to area food banks from what we harvest from the farm. We may ask for money donations to assist us in covering the processing expense. There is such an abundance of deer in our community that its a shame government regulations make it impossible for restaurants, markets, and farms to sell what was hunted locally. Venison is a great source of protein and much healthier for you than red meat. Especially since I know these in particular have been free ranging and grazing abundantly on our farm. It is a bit tricky to source local butchers this time of year to aid us in processing but I believe we have found someone. If anyone is interesting in trying some or our own “farm raised” venison let me know. Although we are not permitted to sell I am hoping we will have enough to give away. Have a great week everyone.